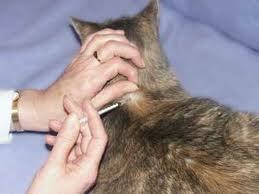 It’s not uncommon for a cat to have a reaction after receiving a shot. As you keep an eye on your pets condition and behavior, you may observe symptoms such as pain, redness or swelling at the injection site, a low fever or a reduced appetite. These are generally mild reactions and rarely a cause for alarm. Serious reactions are unusual but not unheard of. If your recently vaccinated cat suddenly has a seizure, exhibits serious vomiting or diarrhea, or show signs of acute distress, there’s no time to waste. Don’t ever try to administer any pet medication on your own. Rush the animal to an animal hospital immediately. Your cat could be having a very serious reaction called anaphylactic shock. Quick action on your part could save you cats life. This entry was posted on Tuesday, April 26th, 2011 at 8:04 pm	and is filed under Pet Supplies. You can follow any responses to this entry through the RSS 2.0 feed. You can skip to the end and leave a response. Pinging is currently not allowed.